It is just a tiny memory, the flicker of an unexpected something seen from the corner of my mind’s eye – a bluish-purple line on a white paper background – and suddenly there is a rush of remembering one of my favorite parts of being in first grade. The line of color is the outline of something, usually seasonal like a Christmas tree or a snowman or an umbrella or a tulip, or maybe something educational, like three letters that spelled out CAT, that we were supposed to fill in with colors from our treasured 8-packs of Crayola crayons. And then, when we had done that, we got to choose, from the special box in the big art supplies cabinet, a pair of blunt-nosed scissors with which to cut out what we had colored, write our name on the back, and watch Miss Nina pin it on the classroom corkboard with thumbtacks. There were rules, of course. We had to color inside the lines, and cut along the lines. Some kids had difficulty with that, but I didn’t. Maybe that’s one of the reasons I loved those projects – I was very good, back then, at following rules. And even better, sometimes I got to make the hectograph copies – those purple lines on the white paper – for my class. If you don’t know what a “hectograph” is, you probably weren’t in first grade in a country school in the late ‘40’s. 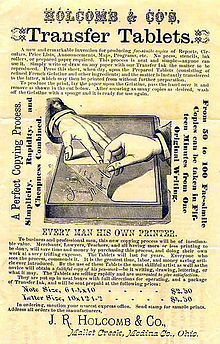 A hectograph was a very simple duplicating device, a (non-toxic) forerunner of spirit duplicators and mimeographs, way, way before Xerox machines and laserjet printers. It consisted of a slab of thick clear gelatin set in a horizontal 8 ½ x 11 wooden frame. An original was drawn on paper with special ink, turned face down on the gelatin and smoothed until the image adhered. Then the original was removed and copies were made by pressing plain paper to the inked gelatin. Because I could be trusted not to mar the gelatin, and because I learned how to make the printing surface just the right texture (not too much water on the moistening sponge, but enough so that the paper would come free and not stick and tear), and because I could count to 23 – the number of kids in my class – I got to help Miss Nina make those magical sheets of paper with the lines that told us where, and where not, to color and cut. I loved coloring inside the lines. Perhaps it was the same satisfaction that is making adult coloring books wildly popular today. There are so many decisions to be made as a grownup, so much responsibility for good choices and judgments, that sometimes it’s a relief, for just a little while, to have someone else determine where the boundaries lie. It’s a lovely distraction to fill up those defined spaces with color, all the way into the corners where two lines intersect, and to feel as if at least for the moment we’re correctly following the rules and hoping someone – a former teacher, a co-coloring friend, ourselves – will give us a nod of approval. Maybe even paste a gold star on our work. Ah yes, I remember the ditto because I grew up in city schools and I guess they were marginally advanced. I was perfectly attuned in those days to staying within the lines; now I find the coloring books counterproductive in that I always want to do something different. But it brought to mind a whole raft of grammar school memories when I card about, and managed to enjoy, being teacher’s pet often. I’m pleasantly surprised at how strong some of these memories are, and how we think of them so fondly. I didn’t have Miss Nina, but I was in the same school. Remember the smell of the basement bathrooms or the weird sound of that tunnel between the buildings? I think of both, more often than I’d like . . . those images, sounds, (and smells) occasionally make their way into my dreams. There must not have been a Board of Health back in the day . . . I don’t remember the hectograph – but I do remember getting to turn the cylinder to make dittos for my teachers. Same idea! It is fun to try to describe that to people younger than me. So many sensory experiences from elementary school (ahhh, rubber cement or elmer’s paste) bring back floods of happy memories. Thanks for sharing yours. I hate to admit this, but I also remember the TASTE of that thick white paste – we’d dare each other to eat it! And that nasty mucilage stuff that looked like . . . well, never mind what it looked like! Let’s get back to the pleasant memories . . . like big fat pencils with which to practice perfect letters on that special yellow paper that had dotted lines between the solid lines so we knew just how high the “chair-seat” part of the lower-case H went. No memory of hectographs here. I do recall drawing on the chalkbtoard with colored chalk. I was in Chicago and went to a friends house for lunch every day because my mother taught high school. I so identified with your description of that stage of my life, the pre-rebellious period. It was oh so nice to reconnect with it. 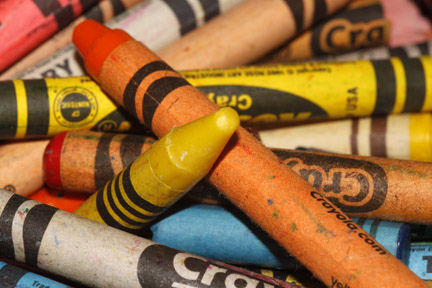 No wonder I loved coloring so much – and coloring WITHIN the lines. And here I thought I might have been the only one who felt this way! We just might have to make ourselves a hectograph and have a special Nostalgic Coloring Day. Your mention of the blue outline brought it all back. I finally am realizing the wonderful relief of letting someone else make the lines…sometimes. Isn’t it amazing, that place in our midsection that holds onto these seemingly unimportant things, and brings us such joy so many years later? I remember those hectographs—my Mom was a first grade and kindergarten teacher when I was younger and that was the only way she had to make copies! And if she had the deluxe stuff, there were even different colors of ink that could be used – but our school had just the one color, as I recall.